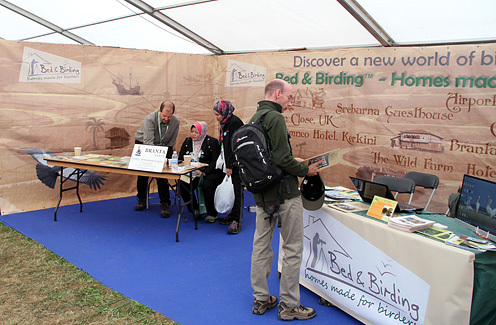 Bed and Birding made its first big publicity campaign for the network with a large stand at the British Bird Fair (the world's largest such event) from 15 to 17 August 2014. The presentation was well received, causing much excitement amongst potential new partners and the general visitors to the show (over 350 brochures were distributed). By the end of three hectic days, we were in touch with 25 potential new partners (from Malaysia, India, Gambia, Panama, Costa Rica, Peru, Spain, Portugal, France, UK, Finland, Poland and Georgia) who had made the decision to join the network in the very near future. This was a great boost for our concept and we expect to grow rapidly. 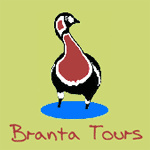 excited to learn more about the Bed & Birding growing global-network. 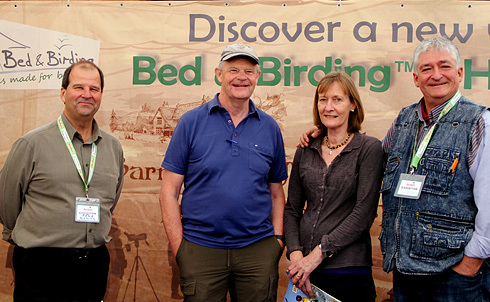 Our UK partners Annie and Mike Robinson (North West Birds) also visited the Bed and Birding stand.